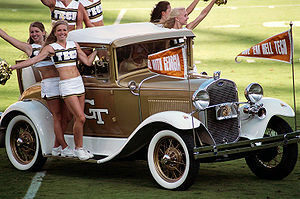 Duke will host the Ramblin' Wreck on Senior Day this Saturday. Duke (3-7, 1-5 ACC) will look to turn their season around on Senior Day this Saturday when they host Georgia Tech (7-3, 4-3 ACC) in Wallace Wade Stadium. While many Duke fans may be tempted to look ahead to basketball season, there are two final chances to watch the Duke senior class with the most wins since 1995 take to the gridiron. This Duke senior class is headlined by All-ACC stars Matt Daniels and Donovan Varner, but also includes 18 other tremendous student-athletes who will leave the Blue Devil Football Program in a much better place than they found it four years ago. Thank you, seniors! 1. Win the line of scrimmage: Broken record time, but seriously. 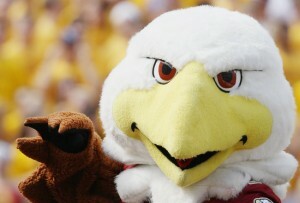 Football is won and lost in the trenches, especially against the Georgia Tech option offense. The Yellow Jackets bring in the top rushing offense in the ACC, averaging just under 320 yards per game. It’s a five-headed monster for Georgia Tech on the ground, led by Tevin Washington, who averages over 70 yards per game, along with 4 other players who average over 30 yards per game in David Sims, Orwin Smith, Embry Peeples, and Roddy Jones. While fans can argue the merits of the Georgia Tech offense, the bottom line is it is effective and will challenge the Duke defense for 60 minutes. If the Yellow Jackets’ big, physical linemen are able to control this game, it will be a long afternoon for the Blue Devils. Conversely, with an offense that is difficult to get off the field, the key for Duke will be getting into the backfield and forcing fumbles. With the number of pitches in the option offense, the Yellow Jackets are prone to putting the ball on the ground (GT has 23 fumbles on the year) and Duke will have to capitalize (GT has lost just 8 fumbles overall). 2. Explosive plays: Georgia Tech brings in one of the most explosive offensive units in the conference, averaging over 36 points per game and nearly 6 yards per carry on the ground. WR Stephen Hill is the top threat through the air, though his production has dropped off in ACC play. Still, the Yellow Jackets’ offense leads the ACC in yards per play both on the ground (5.8) and through the air (11.6). Those are scary numbers for a Duke defense that is banged up across the board. With key injuries to the defensive line and in the secondary, and the potential absence of both starting linebackers, Duke will need to find several unsung heroes on defense. Expect Matt Daniels to be used heavily against the run, as the Blue Devils will have to gamble and hope that Ross Cockrell can handle Hill in single coverage. 3. Duke on offense: Which Duke offense will we see on Saturday? Will they put together a full 60 minute effort? Georgia Tech is allowing nearly 25 points and over 360 yards of total offense on the season, so opportunities will be there for the Blue Devils to score points. The Blue Devils had the Yellow Jackets on the ropes a year ago in Atlanta, but a costly turnover killed their upset hopes. If Duke can take care of the football and put together 60 minutes of offense, they could find some redemption on Saturday. 1. Special seniors: It was alluded to in the opening, but bears repeating. This will be the last home game for a Duke senior class that has won 15 games over the past four years. Kyle Hill will watch his Senior Day from the sidelines, ending an impressive streak of 46 straight starts on the Duke offensive line. The remaining seniors will put forth an inspired performance as they look to end their careers with a big upset win in Wallace Wade Stadium. The Blue Devils will graduate 20 student-athletes from the program on Saturday: Paul Asack, Matt Daniels, Jeff Faris, Guillermo Freile, Ryan Hall, Charlie Hatcher, Cooper Helfet, Kyle Hill, Jay Hollingsworth, Jeffrey Ijjas, Alex King, Jon Needham, Danny Parker, George Pearkes, Kevin Rojas, Preston Scott, Will Snyderwine, Josh Trezvant, Donovan Varner, and Johnny Williams. Thank you, Seniors! 2. More records: Last week, Duke fans watched as senior WR Donovan Varner became the all-time school receptions leader. Varner will look to add to that record over his final two games, but will also look to set a new school record with a catch on Saturday. 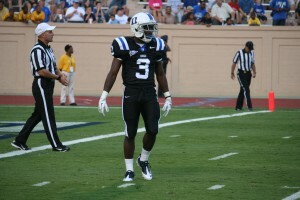 Last Saturday, Varner caught a pass in his 35th consecutive game, tying Scottie Montgomery for the all-time Duke record. Also on Saturday, Varner and Vernon will look to become Duke’s top all-time receiving duo if the pair haul in 5 catches. 3. All-American: Senior Matt Daniels has put together an impressive career at Duke, topped off with an outstanding senior campaign. The quarterback of the Duke defense, Daniels is 2nd in the country in pass break-ups, passes defended, and tackles by a defensive back. Throughout his career, whenever the Blue Devils have needed a stop, it seems that Matt Daniels is there. He has been a tremendous leader for this program and will almost certainly be playing on Sundays next year. A year ago, the Blue Devils faced three option offenses, but this season, just one. The option offense is difficult to prepare for and with a plethora of injuries on both sides of the ball, Georgia Tech will represent a significant challenge for Duke. Duke should have success moving the ball against Georgia Tech if they stick to an aggressive gameplan; expect another big day for Duke’s “Killer V’s.” An emotional pair of seniors in Matt Daniels and Charlie Hatcher will try to will the Blue Devils’ defense to an upset victory, but the explosive Yellow Jacket offense will still find its way into the end zone. With wins over Tulane and Florida International, Duke heads into their Bye Week with a 3-2 record riding a three game win streak. In the two wins, the Blue Devils racked up 868 yards total offense and scored 79 points, while allowing Tulane and Florida International to combine for 886 yards total offense and 54 points. Seeing as Red Zone performance was prominently featured in "The Ugly" section of this season's first stats article, it seems appropriate to address the team's success at the top of this update. Duke scored on all 10 Red Zone possessions in the last two games. Eight of the ten scores were touchdowns. Juwan Thompson ran for four touchdowns of 20, 9, 6 and 1 yards. The ability to successfully run the ball in the Red Zone is a development, which should pay huge dividends in the future. Duke made all four field goals attempted in the two games. Will Snyderwine made three successful kicks and Jeffrey Ijjas was successful on one kick. While Duke has shown vast improvement in these two areas, it is worth noting they still rank last in the ACC in these categories due to the bad start so it is important for the team to maintain improved performance. Obviously, the most relevant team accomplishment the past two weeks was winning the games. In the final analysis, the final score is the most important statistic. Passing Offense improved from 297 to 311 yards per game. Duke is now ranked three of 12 in the ACC (up from number five) and 19 of 120 nationally (up from number 25). Numbers for Total Offense are also impressive with Duke’s 409 yards per game ranks six of 12 in the ACC and 56 of 120 nationally. The ability to sustain long drives results in Duke being ranked two of 12 in the ACC and number 17 of 120 nationally in Time of Possession at 32 minutes and 56 seconds per game. Against Tulane, the Blue Devils reeled off touchdown drives of 18, 12 and 9 plays; while against Florida International they had an 11 play drive which ended with a field goal. Duke’s four touchdown drives in the FIU game were short drives of 1, 3, 4 and 5 plays. Even though Duke achieved success running the ball in the Red Zone the past two weeks, overall Rushing Offense remains a concern. At 97 yards per game, Duke is 11 of 12 in the ACC and number 108 nationally. Conner Vernon leads the ACC in Receptions per Game. His 6.8 receptions per game place him at number 23 in the nation. Vernon is also third in the ACC in Receiving Yards per Game at 101. Matt Daniels leads the ACC in Passes Defended. His 1.8 passes defended per game place him at number five in the nation. Additionally, he is sixth in the ACC in Tackles with 48. Sean Renfree is third in the ACC in Passing Average per Game. 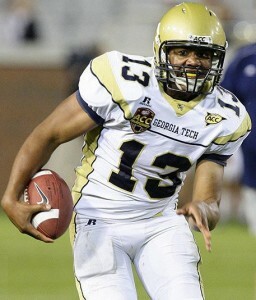 His 272.2 passing yards per game place him at number 25 in the nation. Jamison Crowder is sixth in the ACC in Kick Return Average and ninth in the ACC in All Purpose Yards. He is averaging 21.8 yards per kick return and 127.4 all purpose yards per game. Alex King is fifth in the ACC in Punting averaging 41.2 yards per punt. Donovan Varner is seventh in the ACC in Receptions per Game at 5.8. The next three games will be played in Wallace Wade Stadium so Duke will have home field advantage accompanying momentum gained during the current three game win streak. It is time for the Blue Devils to step up and record a signature victory in order to make the rest of the ACC sit up and take notice. The first opportunity will be on October 15th against the Florida State Seminoles. Duke travels to Boston College for their ACC opener on Saturday at 12:30 PM ET on the ACC Network. Both teams are off to a disappointing 0-2 start to the 2011 season, and one will have the opportunity to turn things around on Saturday. Boston College fell in week one to Northwestern at home, 24-17, and then traveled to Central Florida for a lopsided 30-3 defeat last Saturday. The Blue Devils have seen a similar share of disappointment, losing a close game to Richmond in week one and then Stanford 44-14 in week two. Both teams have been plagued by injuries and have struggled to score on offense, ranking at the bottom of the ACC in scoring. The Eagles will be without star RB Montel Harris for the third straight game, and the Eagle offense hasn’t looked the same without him. With a banged up offensive line and without a go-to wide receiver, Chase Rettig has struggled at quarterback, completing just over 50% of his passes so far this season. Andre Williams has been the lone bright spot, averaging 5.1 yards per carry and 86.5 yards per game, but he’s been unable to shoulder the entire offensive load himself. 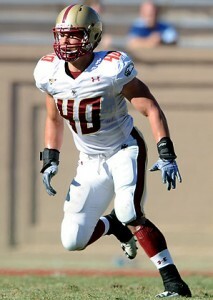 Defensively, Boston College is known for its physical play, epitomized by leading tackler Luke Kuechly at linebacker. With a depleted secondary and a shorthanded defensive line, however, the typically stingy BC defense has allowed 27 points per game, including 231 rushing yards per game. On the season, the Eagles are -2 in turnover margin, and are allowing opponents to convert 41% of 3rd down opportunities. In particular, the 2nd half has been unkind to the Eagles, as they have been outscored 35-7 after intermission. While a few starters will return this week, the Eagles will need to put together a much better effort in all three phases to begin to approach the preseason expectations for this team. Given BC’s struggles, the Blue Devils have an excellent opportunity to leave Chestnut Hill with a 1-0 ACC record if they can put together 60 minutes of good football. Control the line of scrimmage. Boston College’s struggles have mostly been the direct result of losing the battle at the line of scrimmage. With injuries hampering BC’s offensive and defensive lines, this will be an excellent opportunity for the Blue Devils to demonstrate their improvement at the line of scrimmage. Duke needs to do a better job protecting Sean Renfree and consistently opening holes for the Duke running backs. If BC is able to consistently get after Renfree, Duke will continue to struggle to score points. 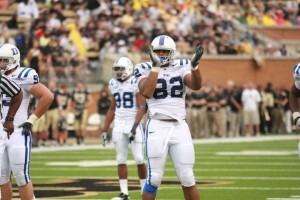 The young Duke defensive line was able to unsettle Heisman favorite Andrew Luck for a few series last weekend. They will have to duplicate that effort and bring consistent pressure at QB Chase Rettig, forcing him into poor throws and turnovers. Establish Juwan Thompson early. Duke is facing a team that is allowing 231 rushing yards per game to opponents so far this season. With Desmond Scott and Josh Snead still sidelined, the powerful sophomore is left to carry the load for the Duke ground game. He’s averaging 5.4 yards per carry on the ground, and against a suspect BC defensive line, he should be ready to have a career day for the Blue Devils. Turn Renfree loose. Duke has moved the ball well at times this year, but has failed to open things up with offensive explosive plays. Establishing Thompson on the ground should open things up for Duke’s talented receiving corps, who should be salivating over a depleted BC secondary. BC’s linebacker’s are the biggest matchup problem for the Duke offense, led by Kuechly and Kevin Pierre-Louis. If BC is forced to use them against the run, the middle of the field should open up for Conner Vernon, Donovan Varner, and Cooper Helfet. If Duke is to win this game, Renfree will have to hook up with one of his receivers for his first passing touchdown of 2011. As you might expect for two winless teams, the statistics are pretty similar, and pretty ugly. Neither team has had much success making plays to win games. With BC’s injuries and offensive struggles, the Blue Devils appear to have more playmakers, and that could be the difference on Saturday. Duke already has three fumbles on the young season, while Boston College has thrown three interceptions. QB Chase Rettig can be pressured into poor throws if Duke is able to bring a consistent pass rush. The BC defenders are capable of delivering the hard hits that have forced the Blue Devils to put the ball on the ground. Simply put, the team that wins the turnover battle will be tough to beat Saturday. Neither defense has been able to get after the quarterback consistently so far this year. What’s worse is that both offenses have done a poor job taking care of their own quarterback. 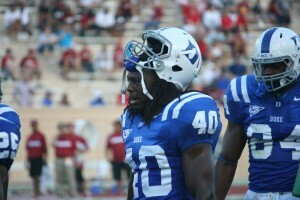 Duke has allowed 7 sacks already in 2011, while Boston College has given up 6. Duke’s offensive line will need to drastically improve its pass protection, or Sean Renfree will again find himself repeatedly on the ground. With their injuries up front, Duke’s defense must take advantage of the Eagles’ shaky blocking. Another dismal statistic for both sides. Both sides are converting around one-third of third-down opportunities while allowing opponents to convert over 40%. Luke Kuechly is the difference maker on 3rd down for BC, and Matt Daniels has been that guy for Duke. With two struggling offenses, the team that is able to sustain drives will find itself in good shape in the 4th quarter Saturday. Explosives comes down to playmakers. Lee Butler made an explosive 77-yard INT return for a TD last week, but it wasn’t enough. Duke needs to open up the field on offense and get Vernon, Varner, Helfet, and Thompson into open space. Jamison Crowder and Lee Butler both have the potential to add explosives on special teams. For BC, it all starts with Andre Williams. He has to consistently break tackles and move the chains if the Eagles are to have more success on offense. Neither team has had much success putting points on the board, but when they do, it’s usually on the ground so far this year. Duke has had three different players score on the ground, and Juwan Thompson will be looking to pick up his first on Saturday. Andre Williams is the primary threat for BC, and expect the Duke defense to key in on him. With Will Snyderwine questionable, expect Duke to gamble more on 4th down than in the past. The kicking game is a complete question mark for the Blue Devils. BC would like to be more consistent, but they certainly have the edge in this matchup. Duke continues to play disciplined football, though a few of their penalties have come at inopportune times, especially on offense. This is a statistic that the Blue Devils will have to win if they want to become a winning football program. Two winless teams with the lowest scoring offenses in the ACC will meet on Saturday, but only one will emerge a winner. The BC offense has looked lost without Montel Harris to hand it off to 30+ times a game. Duke's offense has moved the ball, but failed to score. The historically stingy BC defense has given up yards and points this year, while the Duke defense has performed better than expected, but inconsistently. In the end, Duke has too many offensive weapons for the depleted Eagles' defense, and the Blue Devils' defense should put together another strong showing against a struggling BC offense. Sean Renfree gets back on track and into the end zone in this one, and Juwan Thompson will have a third straight solid game on the ground. 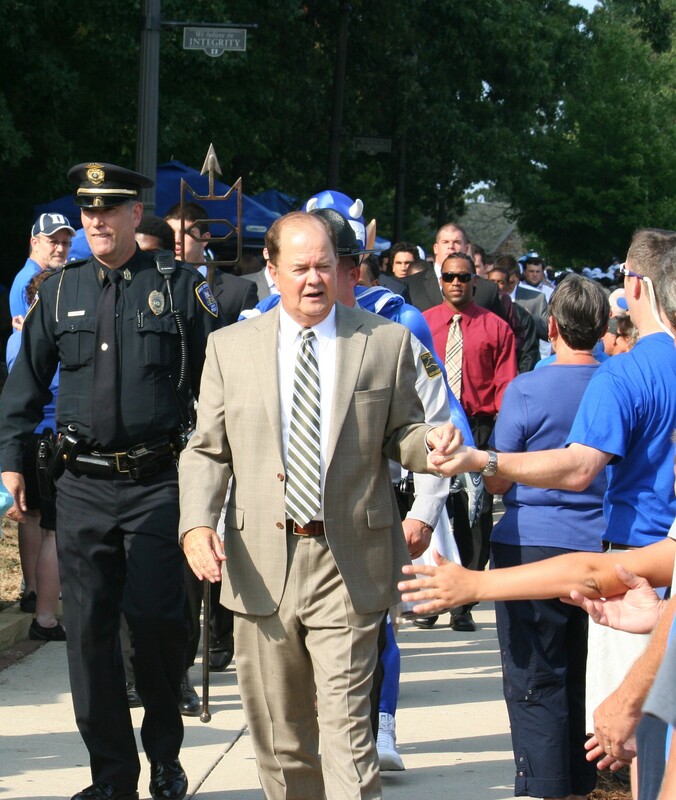 David Cutcliffe is now two games into his fourth season as Head Coach of the Duke Football program, and with the Blue Devils opening the year 0-2, fans are asking whether progress has in fact been made. Progress, however, is a relative term, and one can easily see progress or a lack of progress depending on the context. Start with the big picture. 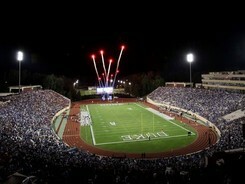 Where was Duke football in 2007 and where is it today in 2011? The Blue Devils opened the 2007 season 0-2 with losses to Connecticut and Virginia. In 2011, they are again 0-2 with losses to Richmond and Stanford. Just as they were in 2007, Duke is again expected by most to finish at or near the bottom of the ACC. At face value, progress has not been made, and it's a reasonable argument. The opposition to that argument is that building a winning football program doesn't happen overnight. 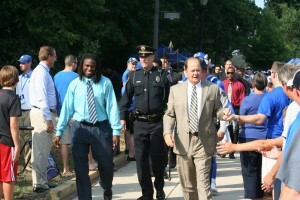 Since Coach Cutcliffe's arrival, there have been substantial improvements made off the field. 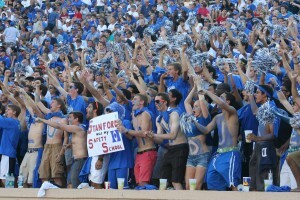 Overall, attendance is up and there is a new-found enthusiasm for football at Duke. The University and its boosters have made a substantial investment in the program, both from a coaching and a facilities standpoint. Duke has a veteran group of coaches and football facilities better or equivalent to every other ACC school. Improvements to Wallace Wade Stadium are in the works, though that will require a significant investment and better production on the field. Speaking of on the field, let's look at the early return on the University's investment. So far in 2011, the wins aren't there, so let's look at the talent level. In 2007, Duke had 1 returning All-ACC player on the roster in Eron Riley. In 2011, Duke returns 3 players who have been awarded All-ACC honors in Conner Vernon, Donovan Varner, and Will Snyderwine. Looking at the makeup of the roster itself, the 2007 Blue Devils entered the season without a single redshirt-sophomore, junior, or senior. In 2011, Duke has 18 redshirt-sophomores, 10 redshirt-juniors, and 7 redshirt-seniors on the roster. The team is developing the kind of depth and experience that is needed to compete week in and week out over the course of a college football season. Based on an informal eye test, the Blue Devils are still an undersized football team, but that is slowly changing. Each recruiting class appears to get a little bigger and a little faster, and recruiting as a whole appears to be paying dividends, with young players like Juwan Thompson (leading rusher), Laken Tomlinson (starting OL), Kelby Brown (2nd leading tackler), and Jamison Crowder (10th in ACC in all-purpose yards) all producing an immediate impact on the field. Let's step away from the big picture and take a deeper look at Duke's 2 losses. A loss to Richmond was inexcusable and a big step in the wrong direction for this team. The mistakes made in that game appeared to be "the same old Duke;" missed FGs, fumbles, and consistently inconsistent play throughout the game. It certainly felt as if we had all traveled back in time to the Carl Franks era of Duke football, a period defined by mistakes and winless seasons. The Blue Devils appeared to be playing not to lose, highlighted by the overly vanilla and poorly executed game plan. Those around the program simply shook their head and thought, "Duke should be better than that. This shouldn't be a bad football team." 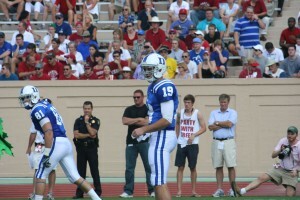 A week later, Duke welcomes #6 Stanford and Heisman favorite Andrew Luck to Wallace Wade Stadium. Most Duke fans, and even some media members, fear a repeat of last year's disaster against Alabama, where the game was seemingly over for the Blue Devils before the ball was snapped. Sure enough, the Cardinal came out and caught Duke off guard with a trick play, ultimately driving the field for an opening touchdown and 7-0 lead. Here we go again. 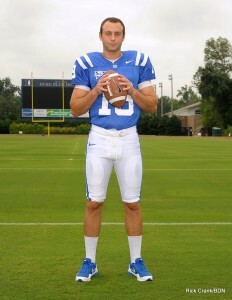 Instead, Sean Renfree leads Duke on a 9-play, 70 yard drive on their first possession to set up a FG. Will Snyderwine, last week's goat, comes in and misses yet another chip shot FG. Here we go again. Instead, Duke's much-maligned defense makes the Heisman contender look uncomfortable for the next 4 possessions, coming up with 2 sacks, and 3 QB hits. Senior safety Lee Butler caps off the improbable start with a 76-yard interception returned for a TD. Duke recovers an onside kick after the PAT, and Wallace Wade is rocking with belief. The Blue Devils appear to be the aggressor and Duke is ready to compete with the #6 team in the country. Of course, that didn't last long, as things quickly turned on the Blue Devils and they were unable to sustain their early momentum. The offensive line stumbles and the Duke drive stalls to close the half. Andrew Luck then returns to his Heisman-caliber form and leads the Cardinal to a 17-7 halftime lead. The 2nd half is dominated by Stanford, with the lone bright spot being a late 4th quarter TD drive engineered by redshirt-freshman QB Anthony Boone. The final score is a lopsided 44-14, and unanswered questions still abound about the state of the program. Was that momentary flash - when we all started to believe - was that real? Who is this Duke team? Are they the team that disrupted the Stanford offense and drove the length of the field with ease to open the game? Are they just the same old Duke, characterized by mistakes and missed opportunities? Has progress been made? It is clear that significant improvements and investments have been made made off the field, but that hasn't yet translated into wins, the ultimate measuring stick. It's been an uphill battle, but Duke must continue to persevere and get better every day - on the field, in the coaching box, and on the recruiting trail. You either get better or you get worse. What will it be for you, Duke Football? The Blue Devils are entering the most crucial part of their schedule, with 3 very winnable games leading into the bye week. Many of our questions about Duke will be answered, beginning with this week's trip to 0-2 Boston College, followed by a homecoming game against Tulane and then a trip to surging Florida International. The Blue Devils must emerge from these three games with at least a 2-3 record, and should be capable of entering their bye week at 3-2 if they work hard to improve their red zone efficiency. After opening 0-2, 3 straight wins would be strong evidence that progress has, in fact, been made. 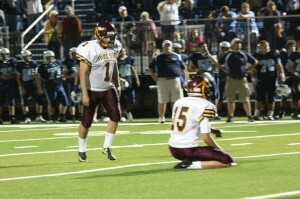 Ross Martin, the top HS placekicker in the country, hits the game-winning FG in his season opener. The Blue Devils secured a commitment from the nation's top high school kicker over the summer in Ross Martin of Walsh Jesuit in Cuyahoga Falls, Ohio. Martin told BDN earlier this summer that Duke has "always sort of been my dream school, because of the combination of world-class academics and D1 ACC football." With the impending graduation of senior Will Snyderwine, Martin will have an immediate opportunity to contribute to the Blue Devil program in 2012, but first, he has big goals for his senior season at Walsh Jesuit. Since BDN last spoke with Ross, he has been named an Under Armour All-American, and nailed a game-winning 29-yard field goal in his season opener. Week One Game Summary: Our season opener against the Louisville Leopards ended in a thrilling finish, as I drilled a last second game-winning field goal as time expired to seal the win for the Warriors. We were down 26-24 with 2 seconds on the clock when I hit a 29 yard FG to win the game 27-26 as time expired. I also made my only other field goal attempt from 42 yards to take the early lead 3-0 in the first quarter. I kept Louisville pinned back all night with my kickoffs and punts, as they never started any drives from beyond their own 20 yard line. I earned the team award for special teams player of the week and was selected as Player of the Game by WHBC who provided local televised coverage of the game. Week Two Game Summary: Our second game was another big rivalry game vs. St. Vincent St. Mary. Falling behind early by a score of 28-3 the Walsh Jesuit Warriors engineered a great comeback and fought back with passion to pull within two points of the Saints with the Warriors falling in a tough loss 48-46. I earned the team award for special teams player of the week. Week Three Game Summary: Last night we hosted the defending State Champions, Columbus Bishop Watterson. It was another tight game going down to the last few seconds with us connecting on a 15 yard pass for a touchdown with 35 seconds remaining to take the lead 26-24, which was also the final score of the game. We now have a record of 2-1 on the season. I was 2 for 3 on field goals, hitting from 35 and 34 yards, and the one that I missed was on a mishandled snap that was laying flat on the ground instead of standing upright. 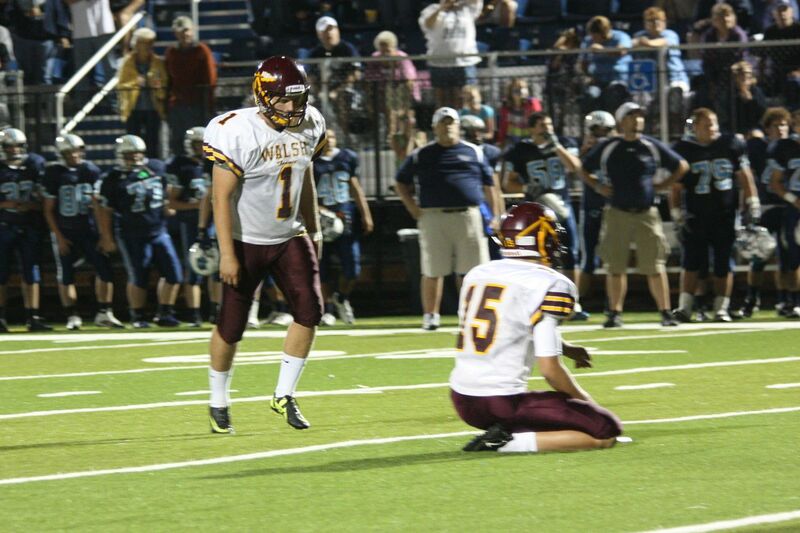 On the season I’m now 5 of 6 on field goals with conversions made from 42, 35, 34, 29, and 27 yards. I also went 2 for 2 on PAT’s last night and am now 10 for 10 on the season and extending my high school career streak to a perfect 54 for 54. In addition, I had another great night of punting for the Warriors with an average of 48 yards on 4 punts and a long of 61 yards. Thanks for checking in with us, Ross! Enjoy your bye week and good luck against Lake Catholic on September 24! 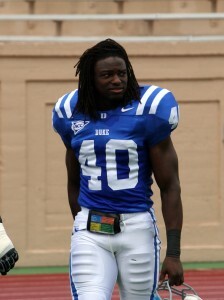 BDN will have periodic updates from Ross and his future 2012 Duke classmates throughout the season.